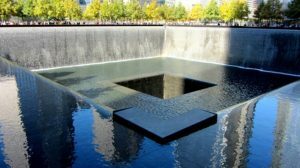 Recently, I watched several documentaries about the terrorists attacks that occurred September 11, 2001. The programs chronicled the lives of several survivors. Each person began by conveying facts, but as they got further into their stories, and details emerged of the loss of friends, personal injury, or descriptions of the horrors they saw that day, emotion took over and tears flowed. I remember my own disbelief and fear that day. The morning was unseasonably cool for September and allowed me time on our deck. I was engrossed in my writing, enjoying a gentle breeze under blue skies, oblivious to crashing planes and lost lives until my husband called and told me to turn on the television. I sat glued to the unfolding horror. As the second plane crashed into tower two, I began to pray. Over an hour later, I was still staring at the screen, curled in semi-fetal position, wondering what was going to happen next. A survivor of the twin towers collapse calmly recounted his story until he reached the point where he described what it was like to have a jumper land in front of him as he exited the building. Overcome with emotion, he said, “I see that image in my head every day.” For this man, PTSD did not manifest until almost seven years after the event. Some might assume the seventh year would be the point at which this man would be moving forward, into a new phase of recovery, but in many ways his journey was just beginning. People process loss, grief, trauma, and tragedy in different ways. That’s why it’s important not to decide someone should be “over it by now.” We negate the magnitude of personal tragedy when we impose our recovery time frame on others, one that seems reasonable to us. We negate the magnitude of personal tragedy when we impose our recovery time frame on others. One of the firefighters interviewed for the documentary talked about his overwhelming anger post-9/11. He lost friends, suffered from survivor guilt, and helped to sift through the rubble of the twin towers. With each picture, personal item, or human remain he uncovered, his anger at the injustice of the situation increased. Later, he was deemed unfit for duty because of injuries sustained and the fallout from breathing so much debris the day of the attack. He swallowed his anger, became depressed, and lost the will to live. He finally agreed to meet with a counselor, who helped him process the complicated emotions resulting from his 9/11 experience. Many people do not realize anger is a component of grief. The best way you can help those who have experienced a traumatic situation is to allow them to express their anger. The same is true if you are the one recovering from trauma. Expression of emotion leads to healing. Many people do not realize anger is a component of grief. When people have lived through a dramatic even like 9/11 or any type of loss or a prolonged crisis situation, they just want it to be over. But emotional healing takes times. The process can be a one-step-forward-two-steps-back kind of progression. Be patient with yourself, or others, as healing occurs. 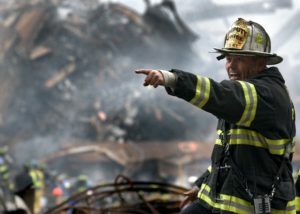 The firefighter who almost gave up on life after 9/11 was able to pull himself out of the depression that entangled him, not unlike the gnarled wreckage around him, with the help of others. He went from feeling he had nothing to live for to realizing how blessed he was to still be alive and with his family. When you are in the midst of grief, despair, hopelessness, difficulty, or depression, it’s hard to see the light at the end of the tunnel, but it’s there. The concern of one person may be all that is necessary to lead you to the light and bring about a change of perspective. 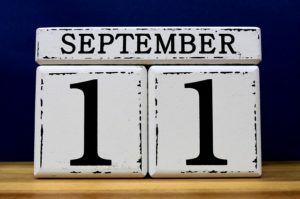 September 11 was a red-letter day for me long before planes crashed into the World Trade Center, the Pentagon, and a field in Pennsylvania. My father died September 11, 1991 after a brief battle with cancer. Five months was not long enough to adjust, accept, and say goodbye. In the 27 years since that September 11, life has moved on. Even though sadness still sneaks up on me at odd times and in unpredictable locations, loss hasn’t held me captive because my Heavenly Father is with me, guarding, guiding, providing me with the calm assure of his presence, and allowing me to maintain forward motion. “Don’t panic. I’m with you. There’s no need to fear for I’m your God. I’ll give you strength. I’ll help you. I’ll hold you steady, keep a firm grip on you” (Isaiah 41:10 MSG). This is a touching, comforting post. Thank you, Candy. I have a tragedy far in my past, but the grief and anger still well up occasionally. It does take time to heal but God is with us every step.